Frankly, HTC Vive does not include a drive for playing DVDs. That’s to say, in order to watch your favorite DVD movies on HTC Vive, you need to rip and convert DVD to a fully compatible format with the HTC Vive. There is a large number of DVD Ripping software available to help you convert DVD videos if you want to play them on HTC Vive although, but they are vary and may make you become confused about which one to choose. On this case, I highly recommend you adopt aPubsoft Blu-ray Ripper, which is a specialist in coping with various issues related to Blu-ray/DVD-conversion. It can help you rip DVD to HTC Vive highly supported MP4 video files with high output video quality and fast ripping speed. What’s more, it can output side-by-side and top-to-bottom 3D formats for you. The equivalent Mac version is aPubsoft Blu-ray Ripper for Mac, which can rip DVD movies to HTC Vive on Mac OS X (High Sierra, Sierra and El Capitan included). How to rip DVD movies for playback on HTC Vive? Install and run aPubsoft Blu-ray Ripper as the professional DVD to HTC Vive Converter. Click the “Load Disc” button on top left corner to Load DVD movies to it. Double click the video, you can preview the movie in the right side. Apart from DVD disc, you can also use the program to rip DVD folder and ISO, IFO image file. As we mentioned above, HTC Vive supports MP4, AVI, etc format. You can click the “Profile” bar and choose one from “HD Video” category. If you want to play 3D movie with HTC Vive , you can choose an output format from “3D Video” profile list. Click the “Settings” button to modify the video/audio parameters. For common videos, 1280×720 HD resolution and 5 Mb/s video bitrate are recommended. 1920×1080 compressed side-by-side 3D should be resampled to 1920×540 resolution full side-by-side resolution. Click on the “Convert” button to rip DVD to MP4/AVI for HTC Vive playback with original quality preserving. The conversion takes a few minutes, if you don’t have time to wait, you can choose “Shut down computer after conversion”. Then your computer will be turned off automatically after the conversion is finished. 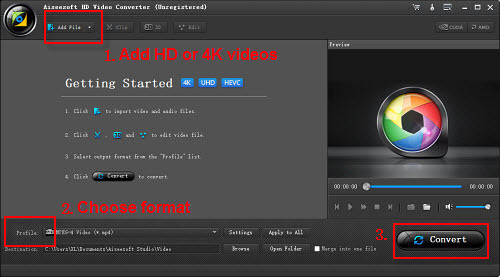 After conversion, you can click “Open Folder” button to locate the output .mp4 or .avi videos. Then you can transfer and play videos on your HTC Vive. 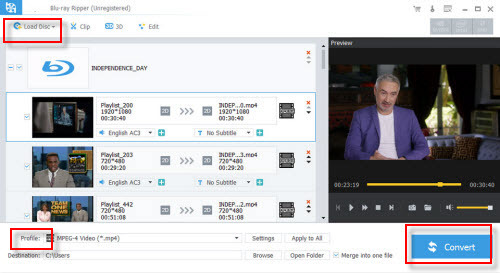 Besides DVDs, the aPubsoft Blu-ray Ripper, which can rip all the newest even region-locked Blu-ray and work in 4K/SD/HD video, TV shows and music dramas. It can accept H.265, MP4, AVI, FLV, MKV, ASF, etc and then change them to 3D SBS MP4/MKV/MOV for HTC Vive. Virtual Reality is a fascinating world which provides the advanced technology to enjoy 3D movies on VR headsets . Mention the VR headset, Google Cardboard 2 is the real hero which is easy to take, best of all, the price is so cheap. lower 10$. Have you got a Google Cardboard 2? Want to watch free 3D video on it? Playing DVD on Google Cardboard 2 with 3D effects can realize this great idea, you can take full use of the old and new DVD disc and enjoy free 3D video on Google Cardboard 2. You have spent a lot of money on your own DVD library, it’s time to enjoy the DVD benefits, you just need a powerful 3D Converter to help you to watch your favorite DVD movies on Google Cardboard 2 with 3D effect. Before you start the work, you need to do a job: Download the Cardboard app from Google Play. It’s a large app – 74.63MB – so make sure you both have room on your phone and that you’re connected to Wi-Fi. Next, change the DVD to 3D video by a 3D converter, following will guide you to know the best 3D converter and simple ways to convert DVD movies to Google Cardboard 2. No doubt, a good 3D Converter can be easy to do, provides the multiple 3D video formats and various 3D effects, who can do the job? aPubsoft Blu-ray Ripper is your dream DVD to 3D video converter, it’s also a perfect DVD ripper which not only can convert DVD to 3D for Google Cardboard 2, also can remove the complicated DVD protection. You can get a perfect 3D video files, such as: 3D MP4, 3D AVI, 3D MOV, etc. At the same time, you have the right to select the 3D video effects, this DVD to 3D video converter creates anaglyph 3D video, Top-Bottom 3D video, Side-by-Side 3D video from common DVD. What’s more, when you get the 3D video from DVD, you not only can enjoy the multiple 3D videos on Google Cardboard 2, you also can choose other VR headset: Oculus Rift, Zeiss VR One and so on. Install and run aPubsoft Blu-ray Ripper as the professional 3D Converter. Click the “Load Disc” button on top left corner to Load DVD movies to it. Double click the video, you can preview the movie in the right side. Convert 2D DVD to 3D video is not as difficult as you image. Here, you just need to click “Profile” bar and enter the output video formats, you can choose “3D Video” category, 3D MP4, 3D AVI. 3D MOV, 3D MKV, 3D WMV are all ready for you, of course, 3D MP4 is the best choice which can be supported by most smart phone, such as: Nexus 6 and iPhone 7 Plus, etc. You can find 3 3D MP4 formats, which are all in different 3D effects, you can choose SBS which is supported by Google Cardboard 2. Press “Convert” button to rip and convert DVD to 3D SBS MP4 video for playback on Google Cardboard 2 with original quality preserving. After DVD to 3D SBS MP4 conversion, you can hit “Open Folder” button to find the generated 3D SBS .mp4 videos. Then, you can transfer the converted DVD movies to Andorid or iPhone and other devices for Google Cardboard 2 enjoyment. You can also choose other VR headset for enjoyment, like: Samsung Gear VR. How to Watch 3D Video on Google Cardboard 2? Place your phone inside the Google Cardboard headset so that the camera can be seen through the cutout. It looks as though it won’t fit because the divider is in the way, but the Velcro should give you enough wiggle room to secure your phone in place. Note that you might need to take off any case you might be using first.To fully enjoy this app you’ll need a Cardboard viewer.